Location: De Anza Park, Calabasas. From Highway 101, take the Lost Hills Road exit. Head south (right if you’re coming from Ventura, left if from L.A.) and go one mile. The park is on your right, at 3701 Lost Hills Road. From P.C.H., take Malibu Canyon Road north for 8 miles (it becomes Las Virgenes along the way) and turn left on Lost Hills. The park is on the left in 0.3 miles. 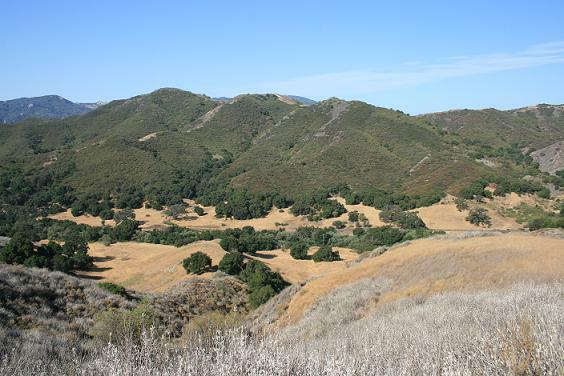 This enjoyable loop visits some of the rolling hills, canyons and grasslands that are typical of Malibu Creek State Park. Good mountain views are also a highlight. The only downside is that the noise of traffic on Las Virgenes Road can be heard throughout. While the area certainly gets hot during the summer, this can be a good hike to do if you get off to an early enough start. Hiking counter-clockwise is recommended, as you will have a little bit of shade on the big ascent. From the eastern end of De Anza Park, look for a paved service road heading south. It soon becomes a dirt trail and enters Malibu Creek State Park. The trail heads right (west), and you get some nice views of the hills as you head into the canyon. (Ignore the false trail branching off to the left). Soon you come to a footbridge, and then you reach a junction. Head right; the left fork is your return route. You pass a sign that incorrectly lists the Liberty Canyon trail as being 0.5 miles away (it’s more like 1.5), and then you begin a moderate ascent on some switchbacks. As you climb, you get some nice views in all directions. The trail levels out on a ridge, and you can see down into Liberty Canyon on the right and the open grasslands and Las Virgenes Road on the left. Straight ahead to the south are some of the mountains of Malibu Creek’s back country. After a few ups and downs, the trail makes a steep descent, reaching the Liberty Canyon fire road. Head left and pass by the end of of the North Grasslands Trail (another access point to this loop). Stay left at the next junction and begin a gradual climb. At this point, you start heading back, paralleling Las Virgenes on the Talepop Trail. There’s one decent sized climb, but for the most part the route is level. At 3.7 miles from the start (1.4 from Liberty Canyon), you complete the loop. Head right at the intersection and retrace your steps to De Anza Park. Text and photography copyright 2012 by David W. Lockeretz, all rights reserved. Information and opinions provided are kept current to the best of the author’s ability. All readers hike at their own risk, and should be aware of the possible dangers of hiking, walking and other outdoor activities. By reading this, you agree not to hold the author or publisher of the content on this web site responsible for any injuries or inconveniences that may result from hiking on this trail. Check the informational links provided for up to date trail condition information.